To travel the globe is a dream to almost every human being. As children all of us say that when we grow up we would like to travel the world and meet different people along the way. However as we grow up we realize that, this is not possible, simply because life is not easy. If you wish to survive today it is imperative that we have a job so that in our old age we are able to sustain ourselves. If you too are someone who is thinking about quitting your job in order to travel, then given here are some of the main reasons why you should not quit your job to travel as this is just not a practical thing to do. No matter how much you would like to travel the world, doing something like this is very impulsive. Keep in mind that once you give up your job on the pretext that you would like to go and travel, there is no company which will be willing to hire you back. Once you are in a professional setting you must ensure that you act in a mature and responsible manner at all times. Doing something like this might show you to be somewhat unsound mentally. So despite your desire to travel and explore new places do try and look at the bigger picture. Just because your friend who has just got back from a travel nature tells you that it was a very fulfilling experience for him, this certainly does not mean that you will be enjoying it a great deal as well. For some individuals traveling is a lot of fun, yet others do not like the experience quite so much. So before you go ahead and quit your job, you should try and figure out just what kind of person you are. 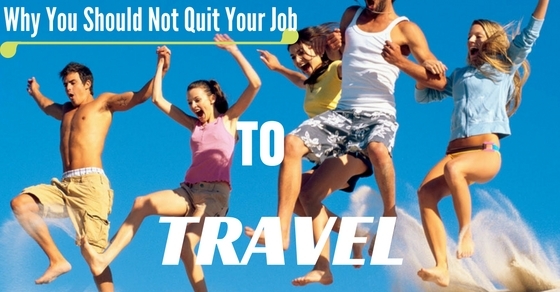 Do not quit your job if you are unsure about what your attitude to travel is. It would truly be disastrous if you chose to give up your job and then found out that you really are not the traveling kind. The thrill of travel is that it is a novel experience. The reason why people love doing it so much is because it functions as a means of escape. Yet if travelling itself becomes a daily chore, then it is unlikely that it will retain the magic which it bears. Many people who have quit their jobs to travel are happy with their decision however, most often than not people end up regretting the decision which they have made. Travelling alone for prolonged periods of time has simply made them feel alone and very isolated. Working in a company is something which has a thrill of its own. It is only once you stop work that you will realize how much you loved your job. Irrespective of how much you love comforts and pleasures in life, you should not make money the be all and end all of your life. If you keep chasing after money without living your life, later on you will have many regrets and a great deal of unhappiness. Though making money should not be the sole reason for your existence, yet it is undeniable that if you want to live a happy life, having money is very important. People who do not have money find it impossible to keep body and soul together. Quitting your job to travel is something you should never consider doing especially if you have a family. Quitting your job is a foolish thing to do especially because once you give up your job finding another one could prove to be an impossible task. Nowadays companies have a great amount of technology to do the work which human beings would previously do. It is for this reason that companies carefully hand pick only a few employees who they are absolutely sure of to be a part of their team. As mentioned above, once you give up your job that company is unlikely to hire you again, but in addition to that it is unlikely that any company will be willing to hire you in the future as well. Having a job to come back after a prolonged period of travelling is a thought which is very comforting indeed. If you quit your job then chances are that you will not feel like coming back. Knowing you have a job, at the back of your mind is a feeling which cannot be replaced for the world. Voluntarily quitting your job for something like travelling is something which many would consider sinful. Most people travel to seek adventure. But if you are truly involved in a career which you love then everyday will feel like an adventure and you need your escape from everyday life to seek such a thrill. Just because you went on a vacation and enjoyed it does not mean that you will enjoy travelling. There is a big difference between vacationing and travelling and this is something which many individuals happen to overlook. Travelling is something which is not easy and is something which is even more stressful than a normal office job. If you think of travelling as an escape from a life of tension and worry then you are wrong. Think about having to survive in an unknown place, without many and you do not even know the language of the natives. A life like this is what many might call frightening. Irrespective of what others might be telling you, having a long break in your career time line is not something which employees take lightly. Companies are on the lookout for people who have a great deal of experience and have been at the helm of things for a considerable period of time, they are not on the lookout for individuals who have decided to quit their job all of a sudden in order to travel. News in the business world travels fast and once you get a bad name trying to remove the tarnish off, your name will prove to be an impossibility. If you do not have a job to come back to, you will keep prolonging your travel more and more. The longer your break is the more detrimental it is going to be for your professional career. It is for this reason that giving your job in order to travel is something which you should not consider. The best part about not quitting your job is that if travelling does not work out, at least you haven’t burned all your boats. You will still be able to come back, dignity intact. A smart individual never makes the mistake of giving up his job at the risk of his future. Irrespective of how liberal you are as a person, thinking about the future is something which is very important. Rather than choosing to live your life in any old haphazard way it is advisable that you live your life as per some design. Childhood is a time to have fun and learn new things, Teenage years are a time to learn new things and to find yourself, adult hood is a time to start a family and work and finally old age is a time to enjoy the money you have made and watch your children grow up. Rather than trying to be a rebel to the way things usually are, you should opt to work as hard as you can during your adult life, so that later on you can have a comfortable old age. Travelling in your old age is something which is a great thing to do. Rather than quitting your job, you can simply ask for some leave from work so that you get some time off to go and travel the world. If the company senior has a big heart he will give you a paid leave, however even if you are not getting paid leave at least you have something to fall back on when you return from your travelling. The big downside of travelling is that you become distant from your family and friends and even if you have fun initially over time you will love to come back to your daily life and survive by that same routine all over again. All big companies which really value their employees ensure that they give their employees perks and bonuses in order to keep them happy. Rather than quitting your job in order to travel, you should just make use of the paid vacation option which is available to almost all employees. In this way you can occasionally get that much needed break which you require in order to renew yourself and connect with your inner self. The best part about getting a paid vacation from the company is that you can travel without having to worry about the financial aspect at all. Rather than taking the big step of quitting your job simply ask the seniors in your company to give you a job which involves more travel. This way you will be able to live out your dream and have a steady means of income at the same time. This is something which many people opt to do. In life rather than quitting you should think of a way where you can be more accommodating. Do pluck up the courage to ask your boss if such a position is available and he is sure to tell you if there are any positions which need to be filled. If you are a good worker, your boss might even make a new position for you. Ask anyone who has spent a portion of their life traveling or globetrotting and they will surely tell you how expensive traveling actually is. It is not like you can get by with having just a few bucks in your pocket. If you wish to be a traveler with no cares in the world then it is vital that you have some big store of money in order to keep you secure and content. If you quit your job and something happened to you while traveling, think about how you would have to pay for your medical treatment all on your own. All of us would love to give up our jobs and head out into the wilderness in order to experience nature at first hand and live life to the fullest. However, things aren’t so simplistic. Travelling is something appealing to the young and old alike but if you quit your job in order to travel, then slowly but surely that magic and charm of travel is going to wear away. However if quitting your job in order to travel is something which you really would like to do then you ought not to let anyone stand in your way. If you have a passion to travel then do what your heart desires but ensure that you think before you go ahead and take any major steps.